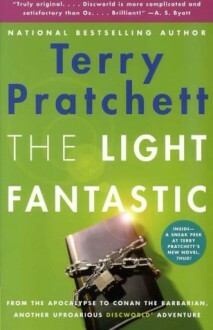 Terry Pratchett's profoundly irreverent, bestselling novels have garnered him a revered position in the halls of parody next to the likes of Mark Twain, Kurt Vonnegut, Douglas Adams, and Carl Hiaasen. In The Light Fantastic, only one individual can save the world from a disastrous collision. Unfortunately, the hero happens to be the singularly inept wizard Rincewind, who was last seen falling off the edge of the world.